It was a good run, old buddy. I'd have to imagine that is something like what Chad Ochocinco said to himself after he was notified by the New England Patriots of his release. It's not a surprising move by New England, which has enough wide receiver depth to sink a ship -- and even less of a shock given Ochocinco's totally ineffective 2011 campaign with the team. His lack of success has been called everything from an emotional issue, to failing to understand the complexities of the Bill Belichick offense and even that the six-time Pro-Bowler is simply washed-up. But whatever the reason for his rapid decline to production -- Chad Javon Johnson-Ochocinco's release signals the end of an era. 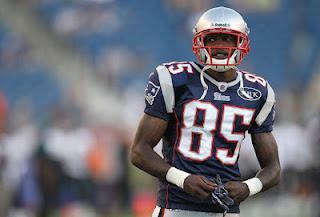 For those who are quick to forget, Ochocinco was a top wideout in the NFL for the majority of his career. He was, as those who are privy to the term like to say -- the bomb. It was like watching a constant highlight reel of quick cuts, leaping catches and smooth dashes to the end zone. There was even a point in time where Chad Ochocino may have been the best receiver in the league, or at least on par with his BFF -- Terrell Owens. And do those guys have a history together or what? The dynamic duo has done it all, from the infamous T.Ocho Show to the absurdly comical Twitter wars, and of course when the two were teammates in Cincinnati with the Bengals. But as good as that combo of Owens and Ochocinco looked on paper, things never really took flight. Where Owens found excellent chemistry on the team and excelled to nearly a 1,000 yard season, Ochocinco struggled and stumbled and found himself isolated in the offense. But despite the obvious difference in play and effectiveness, Chad still managed to find a job (let alone with a Super Bowl caliber team), while Owens was left out in the cold and unemployed (a torn ACL didn't help his situation). I'm sure at this exact moment, Owens just sent a text to his old teammate with four words: welcome to the club. That club -- it isn't the cool kid's one. It's the club of unemployment and blown opportunities. The time where those two were still young enough to get away with stupid antics and bashing organizations has long passed -- and really there should have never been a tolerance in the first place. But the Bengals for the most part turned a blind eye to Ochocinco's repeated offenses -- intentionally wearing improper clothing, promising fans trips and not delivering, etc. -- and although his attitude has come back down to a reasonable level, his play has totally plummeted with it. Maybe it's an ego trip. Something about acting out fuels his play and that's what gets him going in games. New England gave him a shot to win that Super Bowl he has been chasing his entire career -- and he dropped the ball. With that, he's now looking at being forced into a sudden retirement within the blink of an eye. As dynamite as he may have been in the NFL -- the era of Chad Johnson-Ochocinco has officially ended.